I read that Hendrick Motorsports is building an outdoor pit-crew training facility that includes a six-lane track, 75-yard AstroTurf field and strength & conditioning area. It goes to show what they about the rich getting richer while the poor get – well, in NASCAR the poor get left behind. 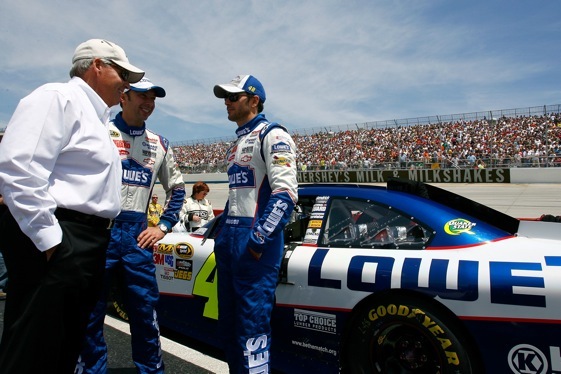 With five consecutive championships in the bag, Hendrick is king of the road. Does it really need more of an advantage? I suppose nobody can begrudge Hendrick for being innovative and working hard to stay ahead of the curve, but at the same time such conspicuous consumption contributes to nostalgic yearnings for the simpler, bygone days of racing. Richard Petty would dust his Pony-ack with baby powder to make the air flow smoother, and after dark Sterling Marlin would climb inside the trunk of his daddy’s race car and shine a flashlight around while Coo Coo stood outside and looked for crack-detecting gleams of light. I know the sport will never return to the Good Old Days when a Good Old Boy could build himself a race car in his back yard, round up a few buddies for a pit crew, and head off to Daytona. Those days are as gone as ducktails, Luckies in a shirtsleeve, and vinyl records. One year the annual NASCAR Media Tour made a stop at gleaming, gated Dale Earnhardt Inc., dubbed racing’s “Garage Mahal.” Then we loaded up and headed to Avery’s Creek, N.C. to visit Dave Marcis’ shop to see how NASCAR’s Other Half lived. Marcis operated out of a cinder-block building. Used engines and other greasy hand-me-down parts were scattered about – donations from some of Dave’s upper-crust racing pals. In one corner sat a barrel full of used spark plugs and other spare items; Marcis threw nothing away. Dave perched on a wooden crate (he had no posh, soft-lit amphitheater for entertaining visitors as did the bigwig teams) and affably admitted that he had no chance. None. Zilch. Nadia. At a time when the mega teams were flying their private jets to wind tunnels, Marcis was cutting garage deals for a set of tires. Comparing Marcis to David, and the mega-teams to Goliath, wasn’t accurate; racing’s Dave couldn’t even afford a rock for his sling. So why did he keep going, wobbling along year after year? Because he loved the sport, that’s why. And the fans and media loved Marcis for his gritty spirit in the face of impossible odds. Today racing has no room for Marcis, Coo Coo and other tough, stubborn old skinned-knuckle warriors of their ilk. And despite all its riches, the sport is poorer for it. What do you want to see, have the rich teams support the poor teams? Some sort of Nascar tax system? Some sort of socialization of sports? The racing is much better today than it ever has been. I listened to Speedway Legends on Moody’s show last night and he was talking to the late Jim Hunter. Hunter said the competition today is worlds better than it was in ‘the good old days’. No one wins by laps anymore. The same thing happens in other sports, look at how much the Yankees and Red Sox pay for their rosters. And they don’t win every year. Things happen. What is left is start and parkers who have bought left over first generation TOYOTA’s that they flooded NASCAR with. They are cheap but no longer contenders. The Wood Bros are about as close to a viable DAVID as THE FRANCES will allow. And that is only because the fans and FORD will not allowed them to be killed off. If Brian France totally had his way…..NASCAR would be F1. Only the $$$$$ survives. Look at the truck series….strictly a TOY-CHEVY SHOW…….and losing fans because of it. MONEY BUYS SPEED…….well it hasn’t changed. Smokey-Banjo-Junior-Bud-Woods…knew they how to get more with less. Petty Penske followed the ” Mr. Mercury Outboard ” templet of BIGGER IS BETTER..that has layed the ground work for HENDRICK ROUSH and TOYOTA..today. Terry has it correct, great.